Testing the strength of standard cement cubes only provides information about cured strength. To accurately and effectively schedule a cementing job with a minimum WOC time, you need to determine how a slurry develops strength over time during curing. The Model 4265 Ultrasonic Cement Analyzer (UCA) provides a determination of the strength development of a cement sample while it is being cured under downhole temperature and pressure conditions. Cement strength is determined by measuring the change in velocity of an ultrasonic signal transmitted through the cement specimen as it hardens. As the strength of the cement specimen increases, the ultrasonic signal’s transit time through the sample decreases. Using proprietary algorithms that have been proven throughout the industry, the relative strength is calculated. The acoustic measurements are read by an internal computer which automatically performs the complex strength calculations. 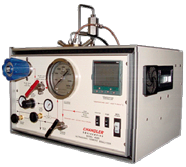 All test data including the compressive strength results are then transferred to a Windows® based computer running Chandler Engineering Model 5270 Data Acquisition Software. The software produces real-time graphs of the calculated strength, measured temperature and transit time.